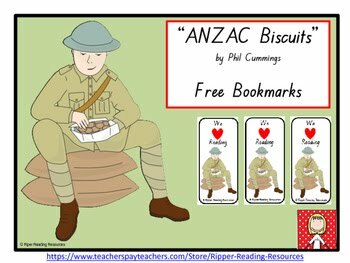 This freebie includes 10 copies of a bookmark (on one page) that teachers can print out for students during ANZAC studies. View a YouTube preview of my "ANZAC Ted" resource. You may also be interested in my ANZAC Day bundle based on three picture books involving dogs in World War 1. Read about this resource and view a video preview of it here. All resources are for personal/classroom use only and are not to be distributed further. Multiple licenses are now available at TpT for a discounted price. No sharing of this resource is permitted through email, photocopying, internet groups/blogs, offline groups, school district or regional websites/servers, discussion lists, school websites/servers, or personal websites. It's Hump Day Happy Hour & A Free Math Game! 3rd Grade Math for December- FREEBIE!